Ferry departing Friday Harbor in the San Juan Islands in Washington, unknown photographer. In a photo like this the exposure would have been set on the light coming through the windows, probably using a light meter. Perhaps an exposure with a medium shutter speed and the lens stopped down to f16 at 200 ISO to get the silhouette effect from the figure and window frames. 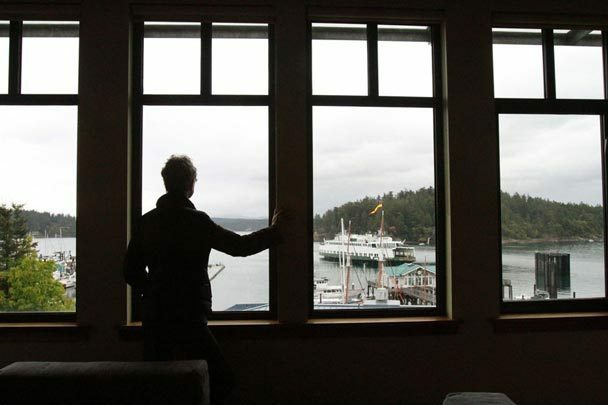 The ferry is carefully framed in one of the windows and the figure watching it depart further draws our attention to it. We used to ride Ferrys like this one on our summer holidays, I may have been on this one at some time. I went back out to Seattle about 10 years ago with a friend and one of the highlights of our trip was a ferry ride through the San Juan Islands. The area is very beautiful.